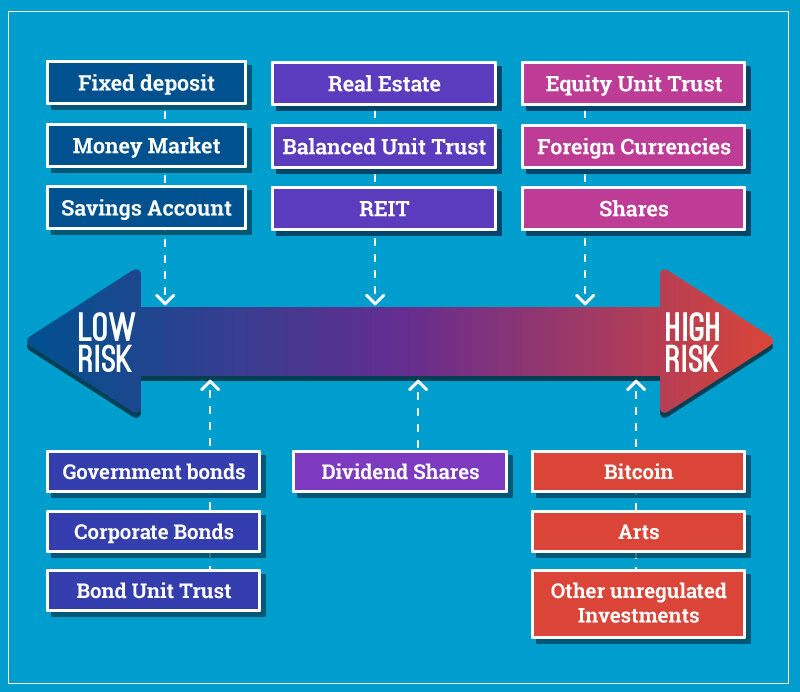 Home › Investment › So You Think You Know Investment Risks? So You Think You Know Investment Risks? 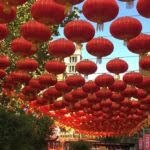 This year marks the 19th anniversary of the 1997 Asian financial crisis and we’re all still feeling the aftermath of it. If you are in the late 20s to early 30s, you would have seen and felt first-hand how the 1997 Asian financial crisis wreaked havoc in your parents’ lives (and probably yours as well). And whether we like it or not, due to the lack of formal financial education, most of us will model our financial management styles after our parents. 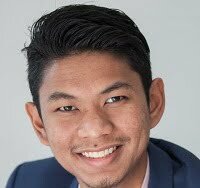 As such most young working Malaysians today are more risk averse as a result from their experiences through the ’97 crisis and they are not properly educated on financial management. They are not sure how certain (if not most) investment products work, what are the risks involved and how much should they invest in the first place. The fear of the unknown has left many Malaysians wary to invest. Even seasoned Malaysian investors have been known to favour conservative investments such as unit trust, as opposed to more aggressive and complex investment products such as shares or even derivatives. 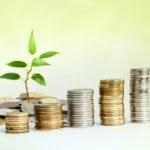 According to Manulife’s Investor Sentiment Index in Asia, a bi-annual survey across Hong Kong, China, Taiwan, Japan, Singapore, Malaysia, Indonesia and the Philippines, showed 53% of Malaysia investors put their money in unit trusts, well above the regional average of 44%. Nearly half (45%) of the Malaysian investors who own unit trusts surveyed, chose unit trusts with overseas exposure, while those who opt for unit trusts without overseas exposure mostly cite risk (61%) as the reason, followed by a lack of knowledge of foreign markets (58%). It is undeniable. Majority of Malaysians are “risk averse” when it comes to investment, not knowing that failure to invest their money lead to risks too. 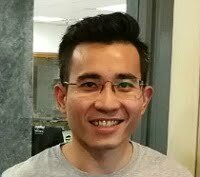 Yap Ming Hui, a bestselling author, TV personality, columnist and coach on money optimisation, from Whitman Independent Advisors, shares with Iris Lee, editor of iMoney.my on how to approach and mitigate risks in investing. Everyone faces financial risks, whether he or she invests or not. Not investing your money has its own set of risks, and so does investing. No investment is without risk. Even if you hire the best financial advisers, and do as he or she say, there is still risk. Unfortunately, to build wealth over time, investors need to accept a certain amount of risk. Leaving money in risk-free investments such as high-yield savings accounts isn’t investing at all as a matter of fact that’s actually barely saving. By avoiding risk and keeping your money in a savings or fixed deposit account practically guarantees you’ll lose purchasing power over the long term due to the rising costs of goods and inflation. What this means is your RM50 will not worth as much as now, five years down the road. “The first step of approaching risks the right way is to know and understand what you are up against,” Yap said. Here are some of the most common investment risks you will encounter, according to Yap. 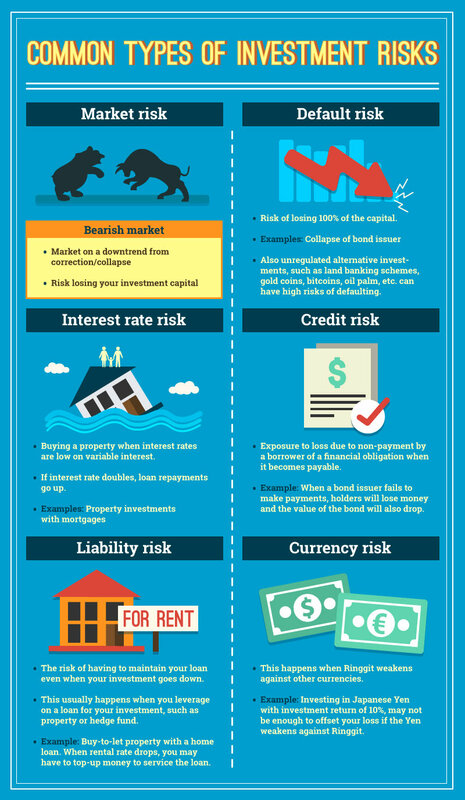 The above are just some of the common investment risks you may encounter. If you are not aware of these risks, you may be taken by surprise. “The sad truth is, most people find understanding risks quite boring and complicated. However, if left unmanaged, it will be too late for them to react when the risk strikes,” says Yap. There are two main groups of investors at both extreme ends of the investing risk spectrum. On one end, there are investors who are risk averse and are afraid to lose money when investing. This group of risk adverse investors could have been burnt in their initial investment experience and they’ve decided to stop investing altogether. On another end, there are investors who are risk takers who aim for high return. This group of investors may have gotten lucky in their investment and are thirsty for bigger returns. With a wider and more sophisticated range of products for consumers to choose from today, the second group of investors are spoilt for choice. “A lot of low risk investors try to conduct research on different investments, and after reading one or two Robert Kiyosaki’s books, or attending some investment seminars, they would jump from low risk to high risk products without proper understanding. As a result, they would get burnt by the investments,” Yap shares from his experience as a financial advisor. So, what should the risk-averse investors do? Stick to one investment product forever? Not quite. Here is a risk spectrum that gives investors an idea on the risk level of different investment products. What should these investors do instead? First of all, investors, whether risk averse or not, should know the investment products’ level of risk for different investment products. Then, instead of making a leap, move in a linear movement, from low to high and do it step-by-step. “By doing so will help them understand how risk increases in each level,” Yap says. The pace of progressive movement along the risk spectrum depends on the investor, but the risk should increase in small dosages. You can progress at a faster pace, but you should always move in a linear manner – never jump from low risk to the highest risk investment out there. Until investors make significant strides in understanding and mitigating these internal and external risk, they would be unable to make the growth that they could potentially make with their net worth. Investors can also engage the right financial advisors to put in place a proper risk infrastructure, to help them strategise, manage and grow their net worth. All investments come with risks, and your job (and your financial advisor’s job, if you engage one) is to determine which investments are worth the risk. Ask yourself these questions: What kind of investor are you? Are you less concerned by the peaks and valleys of investing? Or do you prefer as steady an investing experience as possible? “Know your enemy and know yourself and you can fight a hundred battles without disaster,” Sun Tzu once said. To win in your investment, it is imperative for you to know what you want and what the risks you can possible face in your journey to achieve your financial goals. By understanding the risks, you can be better prepared for them when they strike. Before going into risks, let’s get back to basics. Do you have the right investment objective? Missed the first interview with Yap Ming Hui? Here are the 5 common reasons why the Malaysian middle class can’t achieve financial freedom.